Come see why Santa and his reindeer choose to take residence in Danville during the holidays. Family traditions, holiday-themed entertainment and convenient shopping come together each November and December. Make the entire season merry and bright with a cozy carriage ride through downtown, a parade when Santa arrives in town, and a visit to see Santa at his house. Holiday shopping is both convenient and fun in Danville. Shoppers are gifted free parking from Thanksgiving to New Year's. Some late night shopping events and special savings offers make it easier to enjoy the holidays close to home. Festive music playing along Mill Street will certainly add to the holiday spirit. 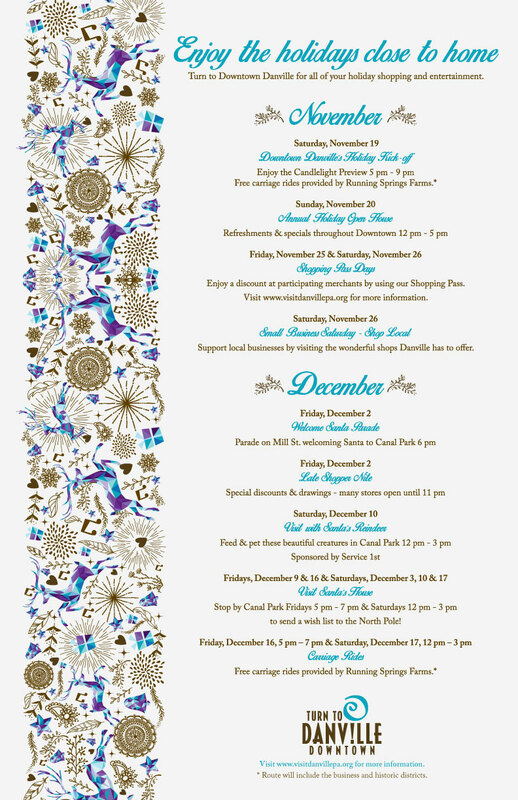 Here's a complete list of holiday activities.